When searching for a solution for missing teeth, convenience and reliability are important. Implant retained dentures restore full chewing function, are aesthetically pleasing and patients enjoy an improved quality of life. Dr. Michael Bleeker is dedicated to providing optimum restorations that improve the quality of life for his Scottsdale area patients. Denture wearers who are tired of embarrassing moments due to ill-fitting dentures, request a more permanent solution from Dr. Bleeker. 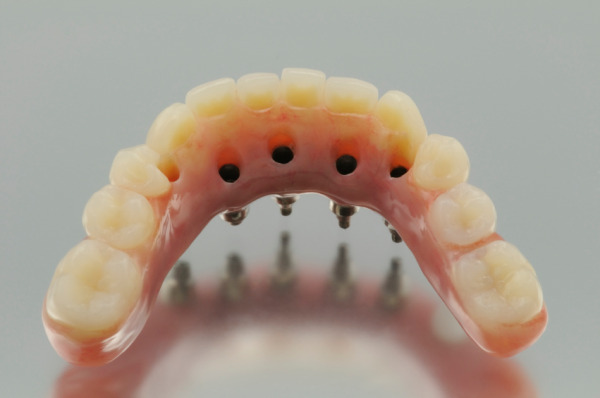 Implant retained dentures are a popular option that gives patients full control over their dietary preferences without the discomfort of a traditional denture plate. A convenient snap attachment can be used to connect the denture plate to dental implants that have been placed in the jaw. These snaps hold the denture plates in place until the patient is ready to remove them at the end of the day. Dental implants replace the root of the tooth and keep both surrounding bone and gum tissue healthy and strong. Implant supported dentures may only require as few as two implants depending on the patients’ oral health and the amount of teeth being replaced. The dental implants have various attachment options to provide a secure base for the denture. When the denture is put in place, the retaining attachments will holding the denture securely in place. Dr. Bleeker teaches his patients how to place and remove the denture for easy routine cleaning. Dr. Bleeker also offers an alternative denture that is a more permanent option. Implant supported dentures are removed by the dentist at the office for a thorough twice-year cleaning. This type of denture has no movement and cannot be removed by the patient. If you are looking to explore all your denture options, Dr. Bleeker will explain the pros and cons of each implant denture option in order to find a solution that best fits your personal needs. Are Implant Retained Dentures Right for You? If you are looking for a solution for poor fitting dentures, visit our state of the art Scottsdale office. We are here to discuss the various options for a reliable, comfortable alternative to missing teeth. Be sure to contact our office today. We are happy to answer any questions you may have about implant dentures. We look forward to improving your smile and comfort. Schedule an appointment today!